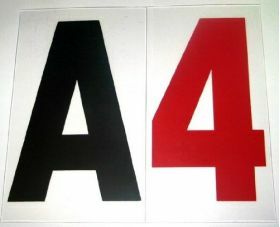 Set of 300 Black letters / Red NumberRigid 4 Inch Marquee Acrylic Letters is printed on a 5" tall .060 thick DR acrylic plastic panel. The letters are black and numbers red. Rigid Letters are for signs using Push Up Drop Down Sign Letter Track ( PUDD). Rigid .060 Letters are about as thick as 2 credit cards and slightly bendable. When changing letters on overhead signs a Letter Changing Arm with a Suction Cup can be used. The high grade acrylic back (panel) is durable and will not discolor, get brittle or crack. Please measure your existing Marquee Readerboard Letters to insure you get the right size letter for your sign.